Mayor Michael R. Bloomberg, Council Speaker Christine C. Quinn and Friends of the High Line Co-Founders Joshua David and Robert Hammond officially opened the second section of the High Line on June 7th. The opening of the second section effectively doubled the length of the public park. The High Line is now one mile long, running from Gansevoort Street to West 30th Street, connecting the Meatpacking District, West Chelsea, and Midtown West. The opening ceremony took place on the High Line at the 23rd Street lawn and seating steps, and was attended by a host of City Officials, dignitaries, and supporters including Deputy Mayor for Economic Development Robert K. Steel; Congressman Jerrold Nadler; Manhattan Borough President Scott Stringer; Parks & Recreation Commissioner Adrian Benepe; City Planning Commissioner Amanda M. Burden; Economic Development Corporation President Seth W. Pinsky; New York City Landmarks Preservation Commission Chairman Robert B. Tierney; Michael J. Kowalski, Fernanda M. Kellogg and Anisa Kamadoli Costa of The Tiffany & Co. Foundation; long-time High Line supporters Barry Diller and Diane von Furstenberg, Lisa Maria and Philip A. Falcone and Donald Pels and Wendy Keys; and Friends of the High Line Chairman John H. Alschuler. Organized C.H.A.O.S., a youth step team from Brooklyn performed at the opening ceremony. At the ribbon cutting ceremony, Mayor Bloomberg announced The Tiffany & Co. Foundation had pledged a $5 million challenge grant to complete the final section, and long-time supporters of the High Line, Donald Pels and Wendy Keys pledged an additional $5 million to double the challenge grant. With the opening of the second section of the High Line, pedestrians will be able to travel for 19 blocks, from Gansevoort Street in the West Village section of the Meatpacking District through West Chelsea neighborhoods to 30th Street. A decade ago, this remarkable urban artifact was threatened with imminent demolition. From the day the first section of the High Line opened in June 2009, it has been one of the city’s major tourist attractions, with well over 4 million visitors from all over the world coming to experience it to date. For those who live in the neighborhood this is just as much a neighborhood park as in other sections of the city: a refuge amid blocks of concrete and steel and streets filled with traffic and noise. 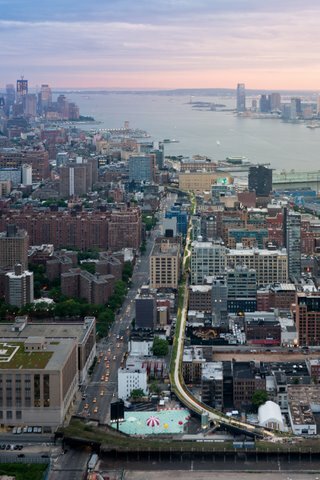 Recognized as a significant contributor in the revitalization of Manhattan’s West Side, the High Line has become a defining feature in its neighborhood and a powerful catalyst for private investment. In 2005, the City rezoned the area around the High Line to encourage development while protecting the neighborhood character, existing art galleries, and the High Line. The combination of the rezoning and the park has helped to create one of the fastest growing and most vibrant neighborhoods in New York City. From 2000 to 2010, the population within the rezoned area has grown more than 60 percent. Since 2006, after the rezoning was approved and construction of the High Line began, new building permits in the immediate vicinity of the High Line doubled and at least 29 major development projects have been initiated (19 completed, 10 underway). Those 29 projects account for more than $2 billion in private investment, 12,000 jobs, 2,558 new residential units, 1,000 hotel rooms, more than 423,000 square feet of new office space and 85,000 square feet of new art gallery space. In May, construction began on a new downtown home for the Whitney Museum of American Art, which will serve as a major cultural anchor at the southern end of the High Line when it opens in 2015. As you approach the High Line on the lower west side of Manhattan, what you see is a harsh, heavy, black steel structure supporting an elevated rail line. What was once carrying freight cars right into factories and warehouses and that looks, at least from a distance, more like an abandoned relic than an urban oasis now offers a park experience with views and walkways that are truly unique and enjoyable to all. What was once a decaying stretch of elevated freight tracks, is now a beautiful neighborhood park that draws visitors from around the world. Capalino+Company served as strategic advisors to the co-founders of Friend of the High Line. Jim Capalino was a founding member of the Board of Directors of Friends of the High Line.